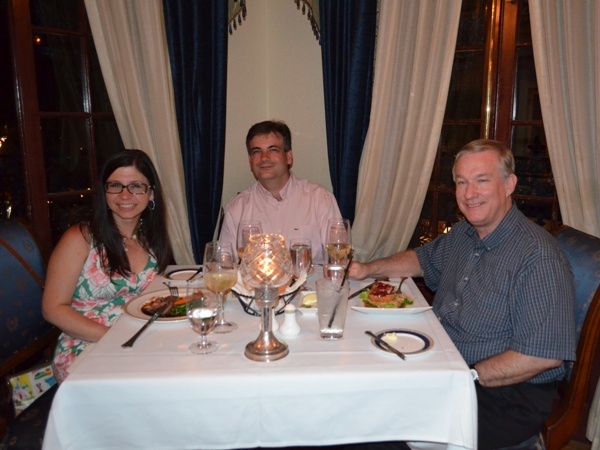 Recently I had the privilege to go to dinner at the famous Club 33 at Disneyland. 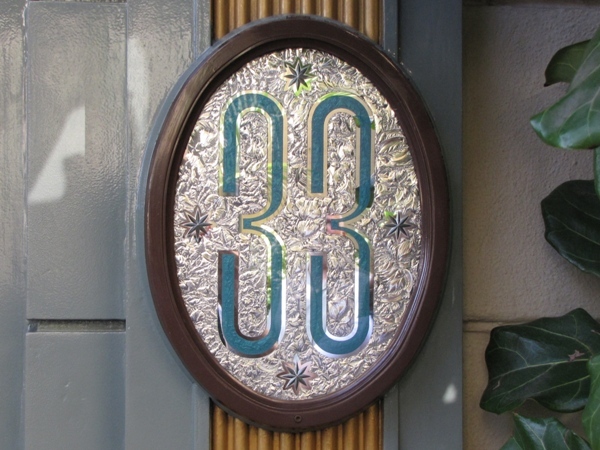 As many of you know, Club 33 is a private, membership-only club, located inside Disneyland. My DIS friends Jeff and Stacy Giovanniello were with me. It turned out to be a pretty amazing evening and I wanted to share with you some of the highlights at this very unique location. I also discussed our evening, as well as some history of Club 33, on a recent episode of the DIS Unplugged Podcast: Disneyland Edition. 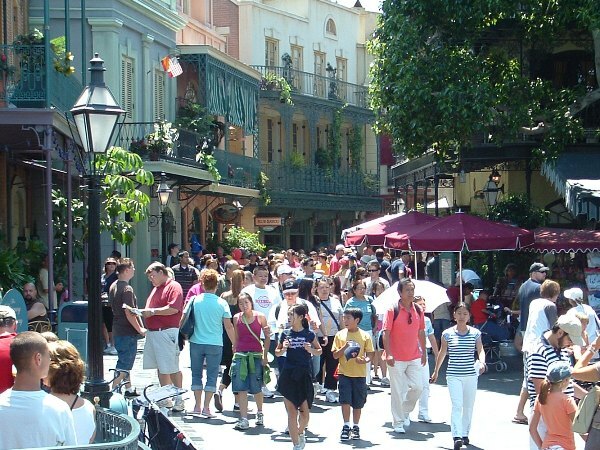 Club 33 is located in New Orleans Square and occupies the upper floors of what appears to be the shops all around the Square. 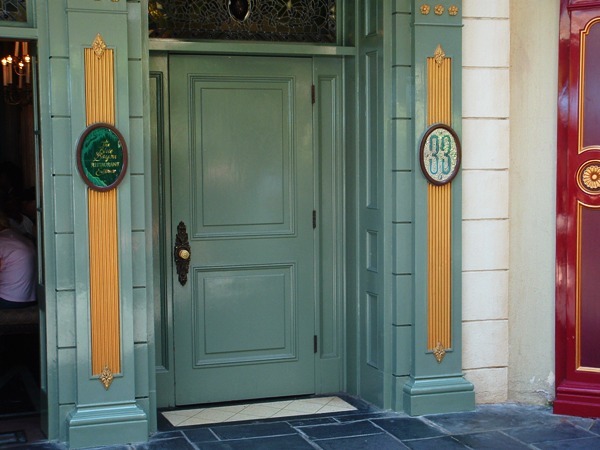 The entrance is cleverly hidden right next to the Blue Bayou, but most of us Disney fans know where the secret entrance door with the “33″ next to it is located. On this night the three of us had dinner reservations and even though most of that day we were touring around Disneyland and Disney California Adventure, the entire day was filled with the anticipation of the evening’s activities. We left the parks a bit early to go get freshened up and change into our evening attire. Club 33 does have a somewhat formal dress code for evening meals and we all wanted to look our best. It was a little strange walking up Main Street in our nice clothes, but maybe from time to time you too have noticed folks who are dressed somewhat out of place for a theme park and wondered what those folks were all dressed up for. We headed up to the famous door and Stacy opened the little flip cover and rang the doorbell. The door opened and a nicely dressed gentleman politely asked, “May I help you?” Jeff proudly stated, “Giovanniello party for 7 pm.” The doorman replied, “Please come in, we’ve been expecting you.” We entered and began what was to be a very wonderful evening. Image: The doorbells are inside the little flip covers to the left. Just inside the doorway is a small lobby area. The doorman asked us if we’d like to check any bags or coats. They will hold anything you like so that your table isn’t cluttered. One thing I noticed is that we were the only ones in the lobby. 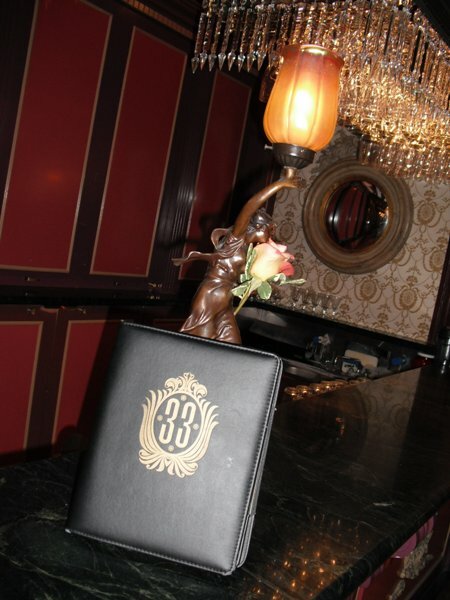 Club 33 staggers the reservations so that once you arrive, you don’t have to wait to be seated. There are two ways to get to the upstairs dining rooms. There is a staircase and there’s also a very elegant little bistro style elevator. 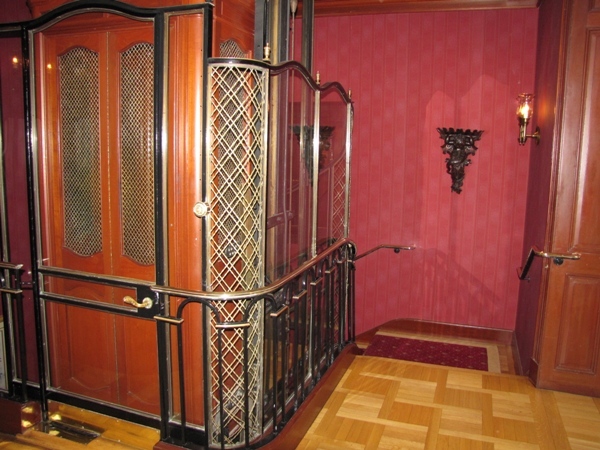 There’s a story that Walt and Lillian Disney were visiting a hotel in Paris and Walt fell in love with the elevator, so he had his Imagineers recreate it for Club 33. We took the elevator and made our way to the second floor. 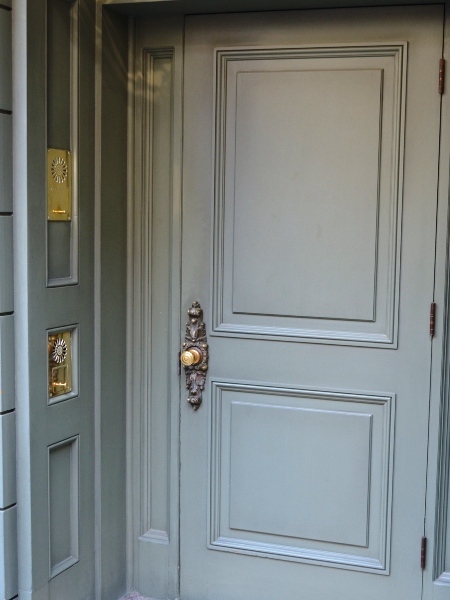 Club 33 was modeled after the VIP clubs of Walt’s day and every detail of the Club is designed for the guest’s experience. As soon as the elevator door opened, we were greeted by name. The main hostess escorted us to our table. This is not pretend or “showmanship” service. 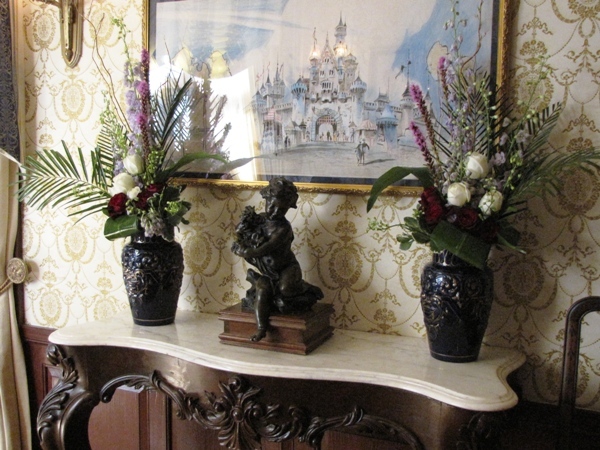 The staff at Club 33 is extremely professional at all times and treats each guest as special. After all, many of the Club’s members are corporate executives, or movie stars, or dignitaries, and you just never know who is going to be attending. Before I go any further, I want to explain about the pictures for this story. While I did have my camera with me, this evening was not a “group event” or a Disney tour. 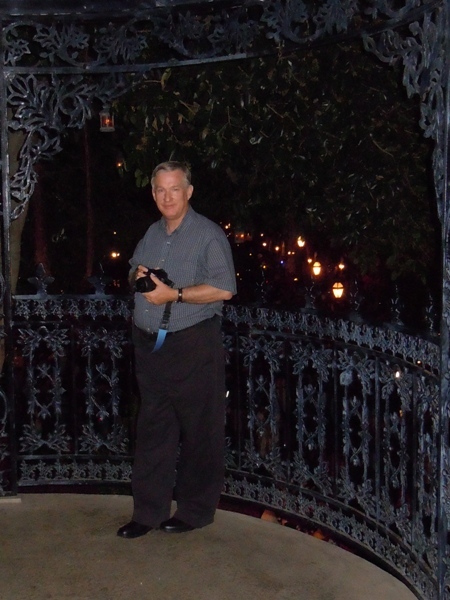 This was a regular evening at Club 33. As such, I wanted to be respectful of the other guests that were attending the Club that evening. I did not want to take a lot of pictures all over the Club with folks who may not want to have their picture displayed in public. I also didn’t want to act like a tourist or a food critic and take flash pictures of every dish we were served. Somehow that just didn’t seem very classy. So instead, I have included some “scenic” style pictures as well as some shots I took from my own Adventures by Disney Backstage Magic tour in 2010. I hope you understand. 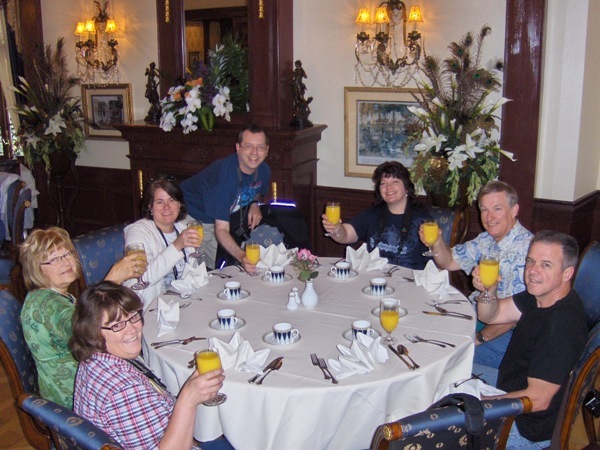 Image: Breakfast with Adventures by Disney Backstage Magic, July 2010. The interior of Club 33 is a wonderful blend of antiques and French inspired design. Disney artists Dorothea Redmond and Emil Kuri designed the Club’s interiors. Every place you look there is something interesting to see. There are collections and trinkets from Disneyland’s history. There are some tasteful props from some of the Disney movies and even some of the Disney family’s personal collection. I will cover more of the history of Club 33 in a future story. Image: A marble table used in the movie Mary Poppins is one of many decorations in Club 33. 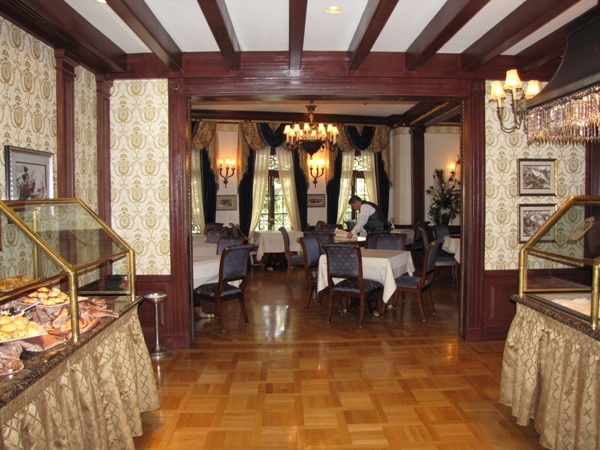 There are two main dining rooms at Club 33. One dining room is called the Trophy Room. 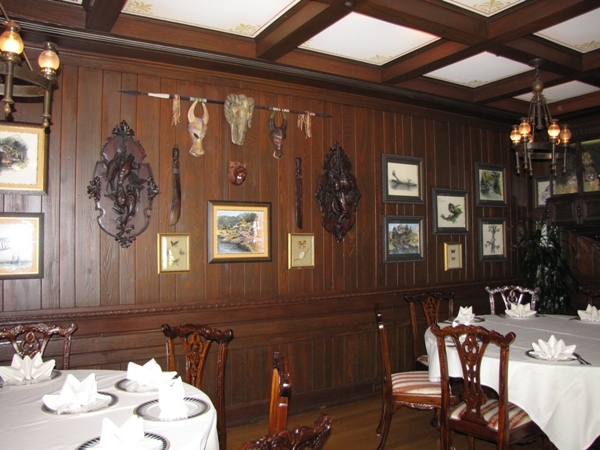 This room is decorated like an “adventure’s club” and was originally to have a small audio-animatronics show. The main dining room is past a connecting room that has an elegant bar and a classic harpsichord. The main dining room is located directly over Cafe Orleans and the outdoor balconies overlook New Orleans Square and the Rivers of America. Image: The connecting hallway, set up for an ABD breakfast, leading to the main dining room. Our table was all ready with the correct number of place settings for our party. We sat down and Jeff instantly recognized the special significance of our table. When Lillian Disney attended the Club, she had a favorite table. It was at the far end of the room, in the corner, with large windowed doors on either side. This was “Lilly’s table” and we were privileged to be seated there. Image: Early morning in the main dining room, prior to opening. Lillian Disney’s favorite table is in the upper right corner. Our waitress came over and gave us the dinner menu for the evening and a wine list. Menus change quite frequently at Club 33 to keep up with the seasons and also with what is fresh at that time. They often change monthly, but sometime even weekly. So you never know exactly what choices you’ll have and what might be different that evening. Our waitress was delightful and extremely friendly. We noticed that she was wearing a 20 year Mickey service ring. It was very nice with Mickey on top and the first year of service engraved on the side. She told us that she had worked at Club 33 the entire time. She let us take a look and I thought how wonderful it is to work at something you love and still be that happy after 20 years. Jeff had done his homework and he selected a Fess Parker Chardonnay (2010). You may remember that Fess Parker played Davey Crockett in the early Disney TV shows and movies. Fess went on to become a winemaker and his winery is still in business today. The wine was excellent and is also available at Napa Rose. 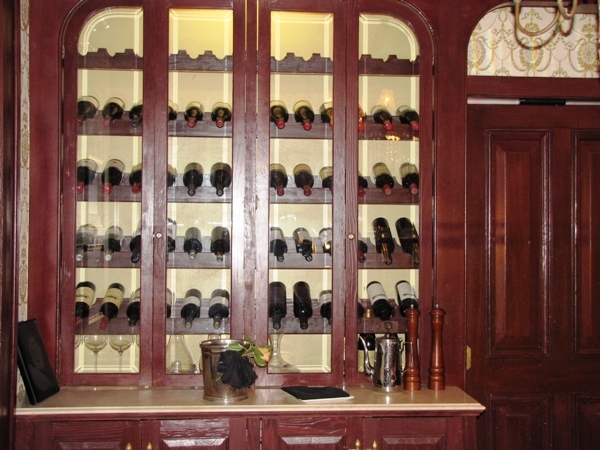 Image: A small wine display case behind the main bar. The menu was fairly simple, consisting of the appetizers (soups, salads, etc.) and then the main entrees. Prices are not as outrageous as you might think, but that isn’t to say that an evening at Club 33 isn’t one of the more expensive meals you might have. 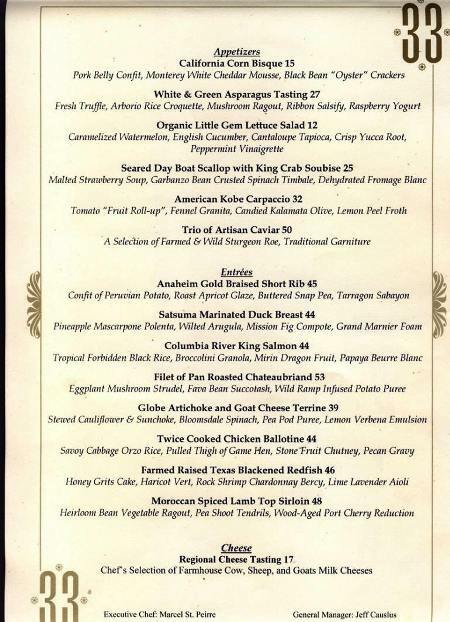 Appetizers are from $12 to $50 (for the caviar trio) and entrees were from $39 to $53 (for the Chateaubriand). There is a per person minimum charge for meals at Club 33, which amounts to the normal single day admission price for Disneyland. 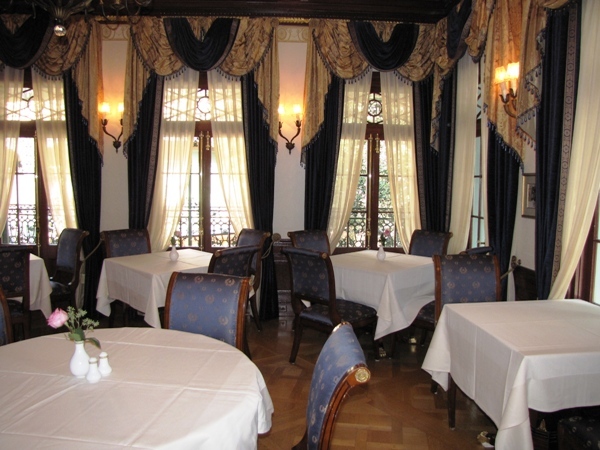 A full meal can easily be more expensive, but when you are at Club 33 you are not likely to be considering the prices. I was having a little trouble deciding on my appetizer and asked our waitress for some help. She mentioned that there was a special “off-menu” Caesar salad. Perfect! I love Caesar salads and this was simple and wonderful. A nice arrangement of Romaine lettuce was topped with a freshly made Caesar dressing with small olives on the side. Excellent! This was leisurely dining. We were not rushed or felt like we had any kind of timetable at all. Conversation and story telling was the main bill of fare for the evening. And inside a venue like Club 33, surrounded by all of the Disneyland history, you could not have asked for a better setting. We were in ecstasy the entire evening. For the main entree, Jeff and Stacy both ordered the Moroccan Spicy Lamb Top Sirloin. This is a lamb dish (top sirloin refers to the cut of meat) with a spinach side. The menu describes it as being served with “Heirloom Bean Vegetable Ragout, Pea Shoot Tendrils, [and a] Wood-Aged Port Cherry Reduction”. The proportion was rather large considering that this was a gourmet meal. And of course, the presentation was beautiful. Again, both Jeff and Stacy thought it was “Great!” and were raving about it the entire time. 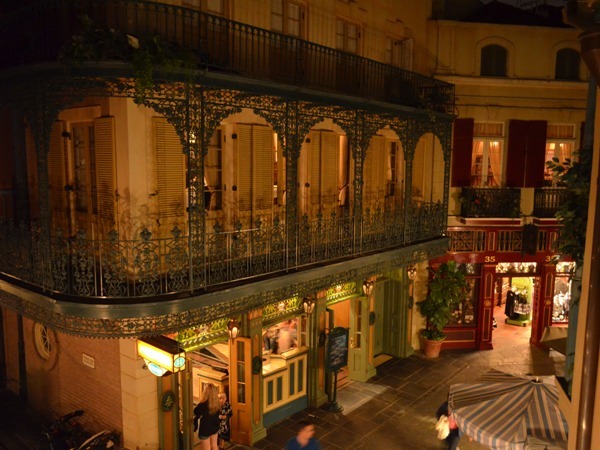 Image: Night view of Royal Street from Club 33. Out of all the entree items available, I decided to go with the Twice Cooked Chicken Ballotine. This was really superb and was served with “Savoy Cabbage Orzo Rice, Stone Fruit Chutney, [and] Pecan Gravy”. This was a game hen and was really tender and full of flavor. And like the other entrees, the proportions were much larger than I expected and the presentation was a work of art. I have no doubt that whatever we selected for dinner would have been spectacular. We casually looked around the dining room at other entrees and everyone had magnificent dishes. We wished we could have tried them all. 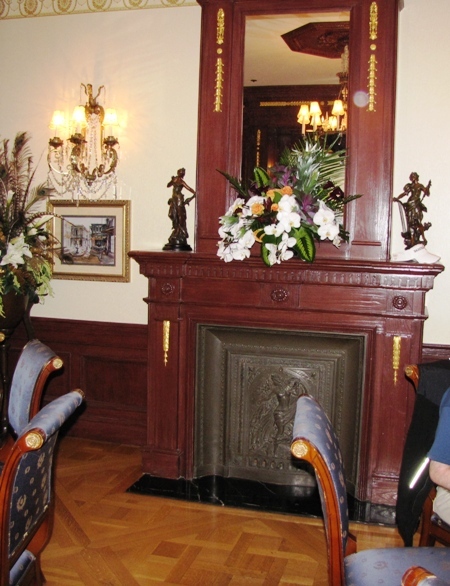 Image: Fireplace in the main dining room. After we finished our entrees and while we were still talking and sipping our wine, we heard the announcement that Fantasmic! would be starting in just a few minutes. Our waitress came over and told us that we were welcome to take our glasses out on balcony and watch the show. They have some small benches on the balcony but everyone wanted to stand. This isn’t the best place to see Fantasmic, as the trees have really grown up over the years and are mostly in the way. But it didn’t matter. You could hear the show and get glimpses of the activity on the water and see all the guests watching from all around the river. This was very special and as many times as I’ve seen Fantasmic!, I think for the experience I will never forget seeing the show from the Club 33 balcony. 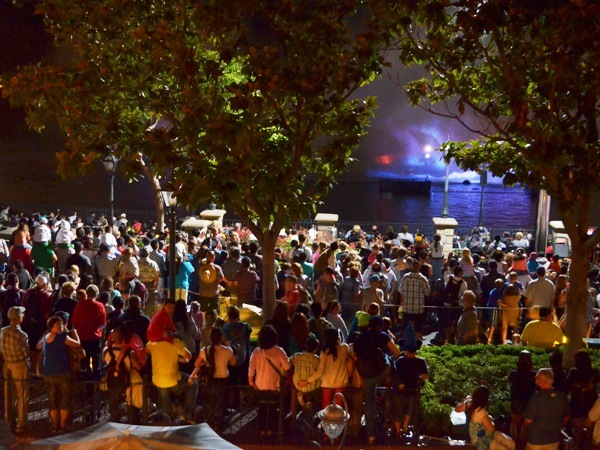 Image: Fantasmic! from the Club 33 balcony. Afterwards we made our way back inside with everyone else. Then, it was time for dessert. We looked at the dessert menu and this was one time when I really wished I was on a cruise ship and could order one of each. Everything looked so good! 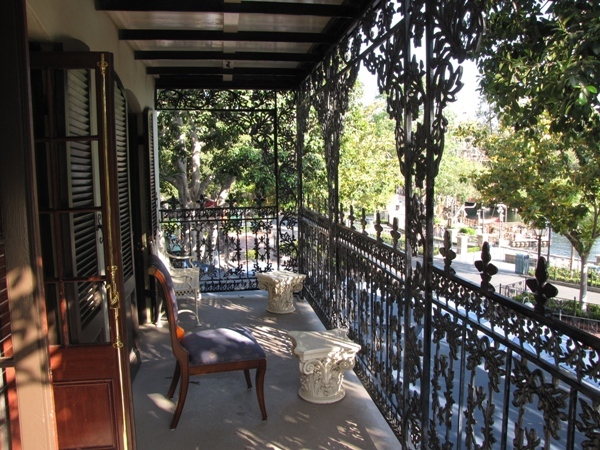 Image: On the Club 33 balcony. Stacy decided on a simple but very elegant Coconut Cake. Jeff and I both had the Double Chocolate Mousse Cake with a freshly made Cherry Vanilla sorbet. Heaven! Jeff could barely finish his and I was just savoring every bite. We also had a Dow Port which our waitress helped us select. It complimented the dessert perfectly and was the perfect cap to our evening. 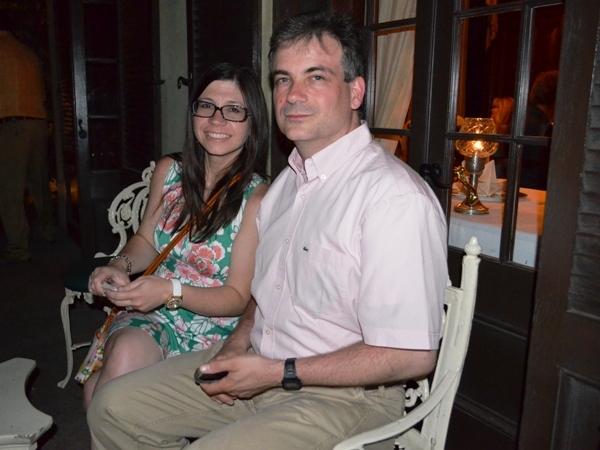 Image: Stacy and Jeff enjoying the evening from the Club 33 balcony. By the time we were getting up to leave it was almost 11 PM (4 hours)! Time flew and even so we did not want it to end. Disneyland was open until midnight that night, but we were stuffed and just wanted to take a leisurely stroll. But there was one more surprise. Stacy and I were admiring some of the decor and Jeff was looking longingly at the harpsichord. 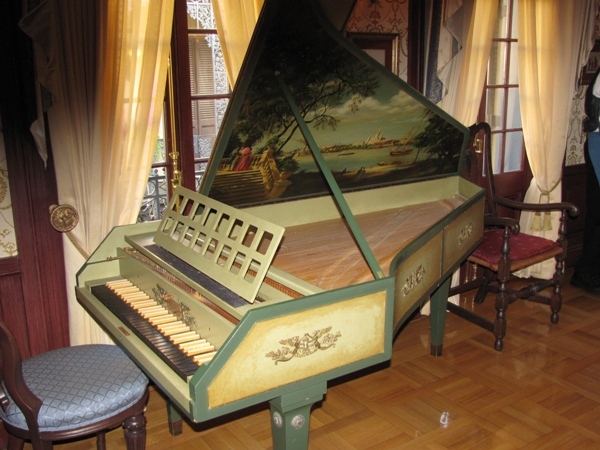 We found out that the harpsichord had been newly refurbished. 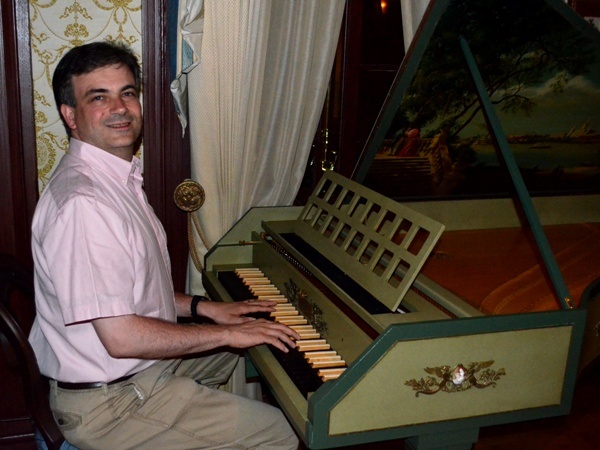 Before we knew it, and with a little nod from one of the cast members, Jeff was playing “Yo Ho Yo Ho a Pirates Life for Me” for us, just like the harpsichord does in the Captain’s chamber of Pirates of the Caribbean! That was a real treat for all of us. Image: Jeff at the harpsichord. It was an amazing evening, certainly a once in a lifetime for most of us. Mostly it was wonderful getting to spend this experience with my friends. That is what really made it special. We all have our Disney moments. But mostly it’s not an attraction or a show or even a very special meal that you remember. It’s the folks who are with you and the experience that you all share together that make it special – that make it magic. So thanks, Jeff and Stacy. And I hope all of you find the friends with whom you too can share your special Disney magic. That’s really what the Disney experience is all about. Image: A wonderful evening with great friends! Table Service, Counter Service, Snacks, Oh My!